Bixby Home is one of the core components of Samsung’s virtual assistant Bixby. It proactively offers information about news, weather, fitness, upcoming appointments, etc. to the users. Sports content from the popular sports website theScore.com is joining the list now. 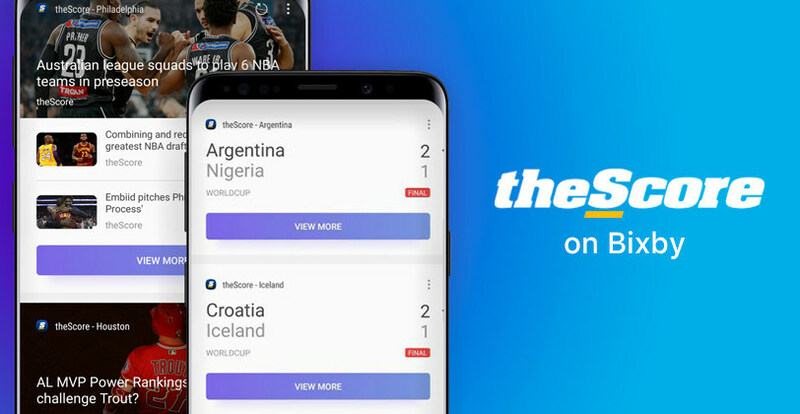 TheScore has announced the launch of sports news and scores on Bixby Home for users in the United States. The service will cover updates from the FIFA World Cup, NFL Football, NBA Basketball, NHL Hockey, MLB Baseball and EPL Soccer. To access the theScore content cards on Bixby Home, users can just press the Bixby button (if available) or swipe right on the home screen of Bixby-compatible Samsung smartphones. Tapping on theScore content card in Bixby will take users either to the theScore app or to the website if the app is not installed. Sports fans can customize the experience on Bixby by selecting their favorite teams and leagues to follow. This can be done either during the theScore onboarding process or by going into Bixby Home settings. “We are happy to provide theScore updates through Bixby. This enables us to showcase the features that have made theScore one of the most popular sports apps in North America to a huge audience, delivering sports fans on Bixby Home a highly-customizable experience and access to their scores and news headlines at a glance,” said John Levy, CEO and Founder of theScore.